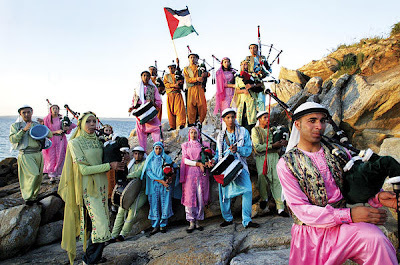 Green Olive Tours Blog • Palestine • Israel: Palestinian Bagpipes?! 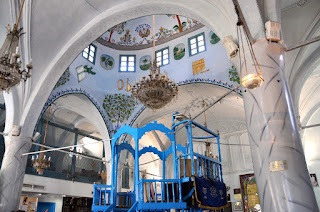 One day I went out to show some friends from abroad the place I live in: Jaffa. That same day the Muslim community was celebrating one of their most important holidays, Eid el-Adha, usually translated as the Feast of Sacrifice. As we were approaching one of Jaffa's main roads we suddenly heard marching music which grew louder and louder. Apart from the usual drum and brass section we also heard... really? Are those bagpipes they are playing? We went closer to the parade and watched and listened to some hundred young scouts, both Christian and Muslim, girls and boys, passing us in their festive uniforms and playing traditional Arabic and Palestinian music on their instruments, including... really? Yes, bagpipes. Being a bit of a music geek, especially when it comes to non-European music, I was actually not that surprised, I had already come across quite a few instruments from the so called aerophone family, some of which look like and produce a similar sound to the bagpipe and which form part of the canon of typical instruments in all sorts of cultural contexts around the world. So although the association of bagpipes with Scotland is probably quite a universal one, it doesn't mean that they are unique to Scotland, or that the Scots invented them. According to the Oxford History of Music a sculpture of bagpipes had been found on a Hittite slab in the Middle East which dated back as far as 1000BC. According to other sources the instrument originally came from the Middle East and was only later introduced to Europe by the Crusaders who returned from war. Another equally debated theory is that it was the Roman army which first used the instrument in their infantry and which thus spread bagpipes basically in all those areas that once formed part of the Roman Empire. 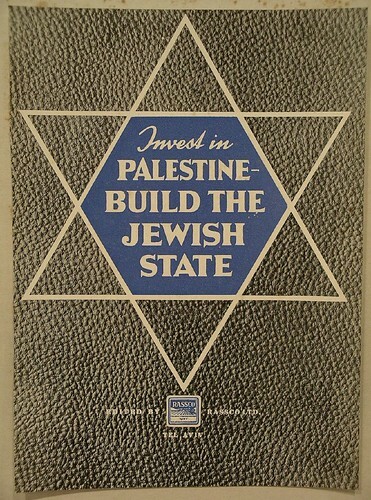 In the case of Palestine most people agree that the instrument was probably known and played by shepherds a long time ago, but that the instrument had lost its usage like many other cultural practices, and was only re-introduced by the British in the 20th century. 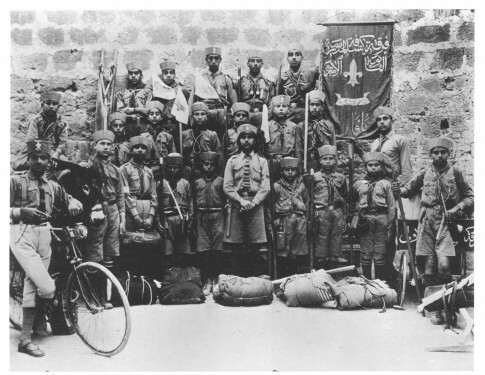 As in all other colonies, or mandates, the British established the scout movement as part of their educational policy in Palestine in the early 1920s. Teaching the young people how to play marching music, including how to use bagpipes, formed an essential part of the scout movement and this is how the instrument supposedly made its return to the region. 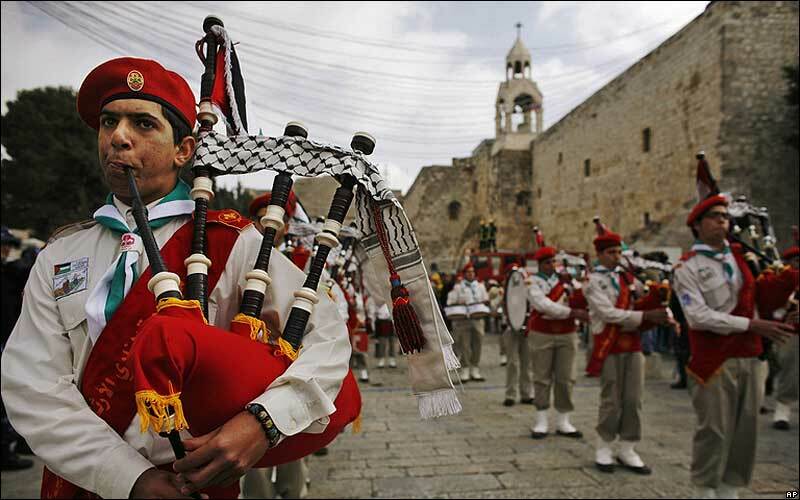 Palestinian bagpipers explain the popularity of the instrument in different ways. On the one hand its sound bears great similarity to some local instruments, particularly the mijwiz double flute, and therefore the bagpipes can be easily combined with other local instruments. On the other hand, one Palestinian academic noted, Palestinians feel some sort of proximity to the Scots, who have been fighting their English colonisers for a long time and whose use of the bagpipes can be seen as an assertion of their distinct Scottish culture and identity. In whatever way the instrument got here, it is commonly used in many official events, parades and during religious festivities and thus forms part of modern Palestinian culture. The case of the bagpipes and its uncertain origin further shows that the positive aspect of globalisation, of sharing and influencing each other is not a new phenomenon at all, but probably as old as humankind.